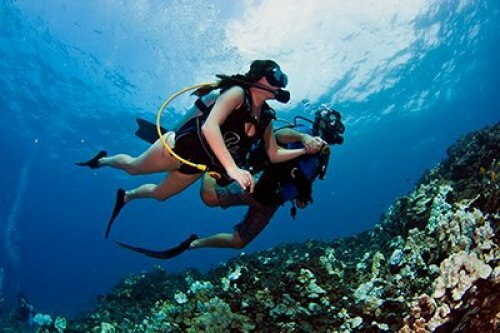 You will learn the basic skills to scuba dive with a dive professional for the morning. This is NOT a certification. As long as possible! Your underwater time will be determined by your air consumption and comfort but average time underwater is between 30-50 minutes per dive. Make sure you come wearing your swimsuit! Bring a rashguard and sun protective clothing and if you must wear sunscreen make sure it is reef safe. Bring your reusable water bottle to cut down on waste. Can my certified family members join me underwater? You will be on the same boat and at the same sites, but in different dive groups underwater. If you wish to dive together the certified diver will need to sign up for an intro with you. You may make changes or cancellations to your reservations up to 48 hours prior to the trip without penalty. Afterwards, all changes, cancellations, or no-shows will not be issued a refund unless the space is filled by another diver. If we are able to fill the space a full refund will be issued. If we are unable to fill the space we cannot issue a refund. The only exception to this policy will be if we receive a medical note from a local doctor for a treatment/exam which must have taken place within 48 hours of the check-in time of the missed dive. This does not waive the companion diver or snorkeler. If you have a "YES", to any question, you MUST have physicians release. If you have a "YES" and do not provide a physicians release you will not be permitted to dive and a refund will not be available if made known less than 48 hours before the scheduled charter.